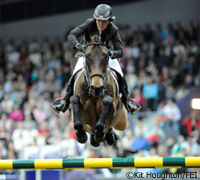 Meredith Michaels-Beerbaum and Shutterfly were the show jumping champions at the 2008 Rolex FEI World Cup Finals. Photo: Kit Houghton/FEI. The annual championships for international show jumping and dressage begin today at the Thomas & Mack Center, in Las Vegas, Nevada and will continue through April 19. This year’s competition is a bittersweet celebration for American sport horse enthusiasts as 2009 marks the last year that Las Vegas will be the host city for the forseeable future. The 2010 show jumping World Cup will be held in Geneva, Switzerland and dressage will be in Hertogenbosch, The Netherlands. Started in 1979, the FEI World Cup Jumping Final is an annual showdown among the world’s best jumping horses and riders. Approximately 45 riders, including many past and future Olympians, qualify from 13 leagues around the world. The United States has won the FEI World Cup Finals seven times, more than any other nation. The 2009 FEI World Cup Jumping Final will be the eighth FEI World Cup Jumping Final held in the United States. Previous Finals were held in Baltimore (1980), Tampa (1989), Del Mar, CA (1992), Las Vegas (2000, 2003, 2005 and 2007). First held in 1986, the FEI World Cup Dressage Final has been held in the U.S. three times, in 1995 in Los Angeles and 2005 and 2007 in Las Vegas. The Netherlands has dominated the competition, winning nine titles, followed by Germany with seven. The United States won its first title in 2003 when Debbie McDonald rode Brentina, owned by Parry and Peggy Thomas of Las Vegas, to the championship. The Thomas & Mack Center, the venue for the FEI World Cup Finals, was named for Parry Thomas. McDonald will be officially retiring Brentina at this year’s World Cup on the afternoon of April 17. Earlier this year, the 18-year-old Hanoverian mare underwent colic surgery and will not be able to perform her famous freestyle as originally planned. She will still make a more subdued appearance for her fans. For more information on all the events visit WorldCupLasVegas.com. hope i can see it today I wonder what time its on? I am SO watching these! does anyone know when it will be on t.v and what channel?